Within 24 hours of U.S. Secretary of State John Kerry slamming Syrian government efforts to change the focus of next week’s Geneva-2 peace talks, Damascus today handed over a plan for an Aleppo ceasefire and readied for a possible prisoner exchange with the opposition. 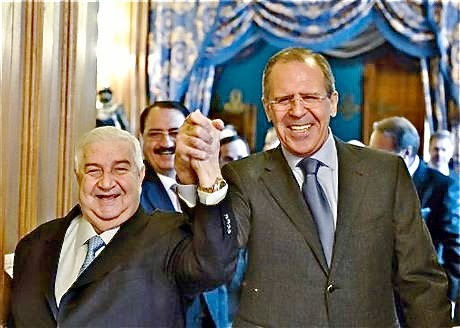 At the news conference held after his meeting today with Russian Foreign Minister Sergei Lavrov at the Russian Foreign Ministry's Mansion in Moscow, Syrian Foreign Minister Walid Muallem said Damascus is ready to negotiate a ceasefire agreement with opposition forces in the flashpoint city of Aleppo. A list of rebel prisoners has also been drawn up in preparation for a proposed exchange of prisoners. “Taking into account the role of the Russian Federation in halting the bloodshed in Syria and our relationship of trust, today I have given Minister Lavrov a ceasefire plan for the city of Aleppo,” Russia Today (RT) quoted Muallem as saying. He asked Lavrov to coordinate with his contacts in the Syrian opposition in order to ensure the execution of the new plan, adding that if it is successful it could be implemented in other areas of the war-torn country. Addressing the issue of the humanitarian crisis in Syria, Muallem said the Syrian government is already working with the UN to deliver aid to “a number of regions.” However, the success of the humanitarian program depends on rebel fighters keeping to their pledge not to open fire on humanitarian convoys, he said. Refuting claims the Syrian Army is bombing its own citizens, Muallem said such allegations “do not reflect the reality of the current situation.” He laid the blame at the feet of terrorist organizations that are being supported by international players. Both foreign ministers said opposition representation is absolutely essential for the success of the Geneva-2 talks, which are set to kick off next Monday. They believe the conference will pave the way for the creation of a transitional government to bring an end to the three-year conflict. The Syrian National Coalition – the main political opposition umbrella organization – is meeting in Istanbul later today to decide whether it will attend the Geneva talks. I know that many of you have been asking about some of the recent revisionism as to why the international community will be gathering in Montreux next week, so let me make it clear here today. From the very moment that we announced the goal of holding the Geneva conference on Syria, we all agreed that the purpose was specifically and solely to implement the 2012 Geneva-1 communiqué. That purpose, that sole purpose, could not have been more clear at the time this was announced and it could not be more clear today. It has been reiterated in international statement after international statement that the parties have signed up to, and venue after venue, in resolution after resolution, including most recently in Paris last weekend when both the London 11 and the Russian Federation reaffirmed their commitment to that objective, the implementation of Geneva-1. So for anyone seeking to rewrite this history or to muddy the waters, let me state one more time what Geneva-2 is about: It is about establishing a process essential to the formation of a transition government body – governing body with full executive powers established by mutual consent. That process – it is the only way to bring about an end to the civil war that has triggered one of the planet’s most severe humanitarian disasters and which has created the seeding grounds for extremism. The Syrian people need to be able to determine the future of their country. Their voice must be heard. And any names put forward for leadership of Syria’s transition must, according to the terms of Geneva-1 and every one of the reiterations of that being the heart and soul of Geneva-2, those names must be agreed to by both the opposition and the regime. That is the very definition of mutual consent. This means that any figure that is deemed unacceptable by either side, whether President Assad or a member of the opposition, cannot be a part of the future. The United Nations, the United States, Russia, and all the countries attending know what this conference is about. After all, that was the basis of the UN invitation sent individually to each country, a restatement of the purpose of implementing Geneva-1. And attendance by both sides and the parties can come only with their acceptance of the goals of the conference. And so on the eve of the Syrian Opposition Coalition general assembly meeting tomorrow (today, Friday) to decide whether to participate in Geneva in the peace conference, the United States, for these reasons, urges a positive vote. We do so knowing that the Geneva peace conference is not the end but rather the beginning, the launch of a process, a process that is the best opportunity for the opposition to achieve the goals of the Syrian people and the revolution, and a political solution to this terrible conflict that has taken many, many, many, too many lives. We will continue to push in the meantime for vital access for humanitarian assistance. I talked yesterday with Russian Federation Foreign Minister Lavrov in an effort to push still harder for access to some areas where the regime played games with the convoys, taking them around a circuitous route instead of directly in the way that the opposition had arranged for and was willing to protect them in. It is important that there be no games played with this process. We will also continue to fight for ceasefires where we could achieve them, and we will continue to fight for the exchange or release of captive journalists and aid workers and others in order to try to improve the climate for negotiations. Now, obviously, none of this will be easy. Ending a war and stopping a slaughter never is easy. We believe, though, this is the only road that can lead to the place where the civilized world has joined together in an effort to lead the parties to a better outcome. And to the Syrian people, let me reiterate: The United States and the international community will continue to provide help and support, as we did yesterday in Kuwait, where we pledged $380 million of additional assistance in order to try to relieve the pain and suffering of the refugees. We will continue to stand with the people of Syria writ large, all the people, in an effort to provide them with the dignity and the new Syria, which they are fighting for. Thank you. Labels: Aleppo ceasefire, Assad, Geneva-1, Geneva-2, Kerry, Lavrov, Muallem, Prisoner exchange, Russia, Syria, Syrian National Coalition, U.S.